It was a gargantuan undertaking, but for decades Jackson Clinton Van Meter (“J.C.”) labored toward his goal: to compile a history of the Van Meter family in America. The old Dutch clan gained a foothold in the New World in the 17th century, when pioneer Jan Joosten Van Meteren arrived with his wife and five children and began to accumulate property in New York and New Jersey. By the early twentieth century, J.C. estimated that there were about 20,000 Van Meter kinfolk to track down. 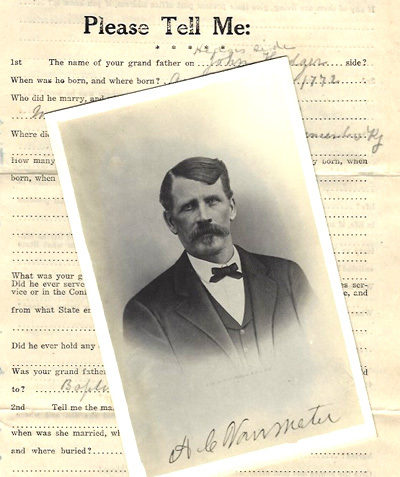 From his Edmonson County, Kentucky home, J.C. searched diligently for Van Meters and members of related families, sending letters to them all over the country and asking them to supply detailed information about their ancestry. “Please Tell Me:” was at the head of his preprinted, fill-in-the-blanks questionnaire that asked the subject to begin with his/her grandfather and supply names, dates, birthplaces, occupations, professed religion, marriages, children, and so on. J.C. would also type out tailor-made questionnaires, particularly where he was in need of certain information or the recipient had failed to supply a full genealogy. New contacts gleaned from one subject would lead to a fresh round of letters and questionnaires. In addition, J.C. vacuumed up data from other researchers of the same family lines and incorporated it into his collection. To encourage his subjects to participate, J.C. had a unique selling point: somewhere back in the mists of time, the Van Meter family had married into the mysterious Hedges family. Legend had it that one Charles Hedges died in England leaving some $269 million to a nephew who had emigrated to America. The inheritance lay unclaimed in the Bank of England while the Van Meters and Hedges multiplied across the ocean, but J.C. theorized that if all the present-day heirs could be proven and the results presented to the Bank, the massive fortune could finally be distributed. Hmmm. We’ve seen this before. And while we can’t conclude that J.C. believed the Hedges estate to be genuine (it wasn’t), it still allowed him and many, many Van Meters to fantasize about hitting the jackpot…and, incidentally, it generated a mass of genealogy, now held in the Manuscripts & Folklife Archives of WKU’s Library Special Collections. Click here to access a finding aid. For more family research collections, search TopSCHOLAR and KenCat.